You don’t need to spend a small fortune to update your bathroom. By changing something as simple as the lighting or fixtures, you can give your bathroom a whole new look. 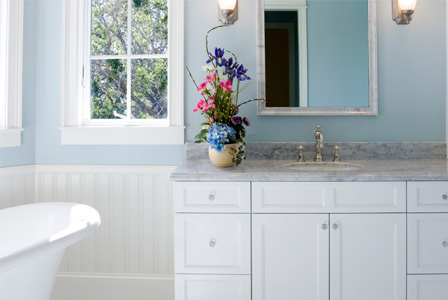 Check out these ideas for cheap and chic bathroom makeovers. A cluttered, disorganized bathroom can drive you crazy when you’re getting ready in the morning. Get organized by adding baskets, containers and shelving to put everything its place. A tall storage cabinet like this one from Walmart is a cheap and chic addition that can provide extra storage space and a touch of style. The open shelving is convenient, plus you also have a closed cabinet and drawer to hide toilet paper, shampoo and other items. Fun, colorful pieces can add some flair to your bathroom. Add pops of color in the form of towels, a shower curtain or accessories to take your bathroom from drab to fab. 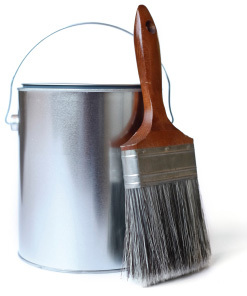 One of the cheapest (and easiest) ways to upgrade a room is with paint. In the bathroom, you can repaint the whole space or just an accent wall with a bold, glossy color. Maybe you don’t need a new mirror, just a new frame. 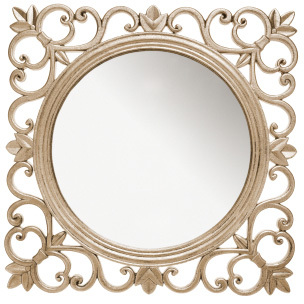 If you have a basic plate-glass mirror, just purchase molding from your neighborhood home improvement store. Cut it to size, paint it and affix it to the edges of your mirror. A framed mirror looks much more sophisticated and modern than the unframed variety. You don’t need to be an electrician to upgrade your bathroom lighting. Instead of replacing your fixtures, just add more lighting in the form of wall sconces. You can place the sconces on each side of your mirror to make it a focal point. Affordable sconces can be found for less than $25 at LampsPlus.com or your local lighting store. Don’t re-do your entire bathroom, just update your tub. If you’re tired of a dingy, small bathtub, give your bathroom an instant lift with a new one. Removing and installing a new tub isn’t as difficult as it sounds. With the right instructions and some hard work, you can do it in a weekend. The staff at Lowe’s or Home Depot can provide some excellent assistance in choosing and installing a new tub. If installing a new tub sounds like too big of a task for you to take on, upgrade your bathroom by changing the fixtures and hardware instead. Change your bathroom hardware for just a few bucks. Also, a new faucet in the sink or a new showerhead can make a big difference in the efficiency and look of your bathroom without costing an arm and a leg. 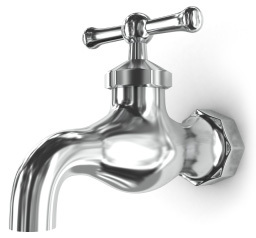 This DIY video from Moen walks you through all the parts, tools and steps to properly install a new faucet in no time.